Olympic medals use a lot of metal but these days the gold medal is mostly silver. The silver medal is sterling silver while the bronze is largely copper. The last time the Olympic Games handed out solid gold medals was a hundred years ago at the 1912 Summer Games in Stockholm, Sweden. Gold medals were in fact only gold for eight years. The 1904 Olympics in St. Louis introduced the gold medal as the prize for first place. "Gold prices have risen sixfold in the last ten years alone," says Terry Hanlon, president of Dillon Gage Metals in Dallas. "Prices climbed from $300 an ounce a decade ago to $1,895 last year." The yellow metal has declined a bit since and stands at $1,580 in July. Silver prices have also surged in the last decade but are considerably less than gold at $27.00 an ounce in July, Hanlon notes. This year's 2,300 Summer Olympic medals were guarded at the Tower of London until the Games began on July 27th. 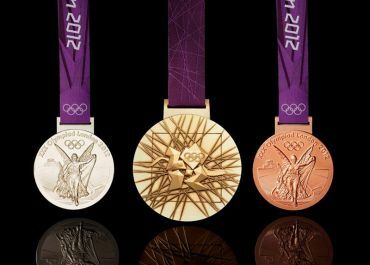 The 2012 gold medal is 92.5 percent silver and 1.34 percent gold, with the rest copper. The silver medal is 92.5 percent silver, with the remainder copper, and the bronze medal is 97 percent copper, 2.5 percent zinc and 0.5 percent tin. The 2012 medals were made by Royal Mint, owned by the British government, but it didn't automatically receive that contract. The Mint competed with more than two dozen other contenders to win the contract to provide 4,700 medals for London's Olympic and Paralympic Games. Artists chosen from across the UK were invited to present their designs to the London Organizing Committee of the Olympic and Paralympic Games or LOCOG. The LOCOG Victory Ceremonies team and the British Museum's Keeper of Coins and Medals worked together on choosing a design. And according to the British Museum, medals with text and images integrated on both sides have a colorful history in Europe, where they first appeared in the fifteenth century. For the London Olympics, judges chose British artist David Watkins' design. It has a jewel-like logo on one side and Nike, the Greek Goddess of Victory, stepping out of the Parthenon on the other. The 2012 Olympic medals were made from nearly nine tons of metal from Rio Tinto's Kennecott mine in Utah and its Oyu Tolgoi mine in the Asian nation of Mongolia. The Royal Mint in South Wales produced the 2012 medals in a ten-hour process, using a 1,400 degree furnace. In that process, the mint placed nearly 1,000 tons of weight on a special press. This year's medals are larger than usual for the Olympics. Each weighs between 375 and 400 grams, depending on the alloy, and is 85mm in diameter and 7mm thick. 15,000 athletes from over 200 countries are competing in the Olympics and Paralympic Games. The UK has been preparing for years to make the 2012 London event among the most spectacular Games ever. America's eyes will be glued to the Games. "This is expected to be a very big, winning year for the U.S.," Hanlon says. "I look forward to cheering our athletes on and watching the USA bring home the gold!" Sort of. Want more information on precious metals? Click below.